Here are some snazzy birthday facts about 17th of August 1958 that no one tells you about. Don’t wait a minute longer and jump in using the content links below. Average read time of 10 minutes. Enjoy! What day was my birthday Aug 17, 1958? August 17, 1958 was a Sunday and it was the 229th day of the year 1958. It was the 33rd Sunday of that year. The next time you can reuse your old 1958 calendar will be in 2025. Both calendars will be exactly the same! This is assuming you are not interested in the dates for Easter and other irregular holidays that are based on a lunisolar calendar. What day is August 17 this year? There are 117 days left before your next birthday. You will be 61 years old when that day comes. There have been 22,163 days from the day you were born up to today. If you’ve been sleeping 8 hours daily since birth, then you have slept a total of 7,388 days or 20.23 years. You spent 33% of your life sleeping. Since night and day always follow each other, there were precisely 751 full moons after you were born up to this day. How many of them did you see? The next full moon that you can see will be on May 18 at 21:13:00 GMT – Saturday. Fun stat: Your first one billion seconds (1,000,000,000) happened sometime on April 25, 1990. If a dog named Chucka - a Mutt breed, was born on the same date as you then it will be 290 dog years old today. A dog’s first human year is equal to 15 dog years. Dogs age differently depending on breed and size. When you reach the age of 6 Chucka will be 42 dog years old. From that point forward a medium-sized dog like Chucka will age 4.5 dog years for every human year. View the complete list of August 17 celebrity birthdays. Who are the famous August 17 birthdays? Here’s a short list of famous people in history who were born on Aug 17. View the complete list of August 17 famous birthdays. 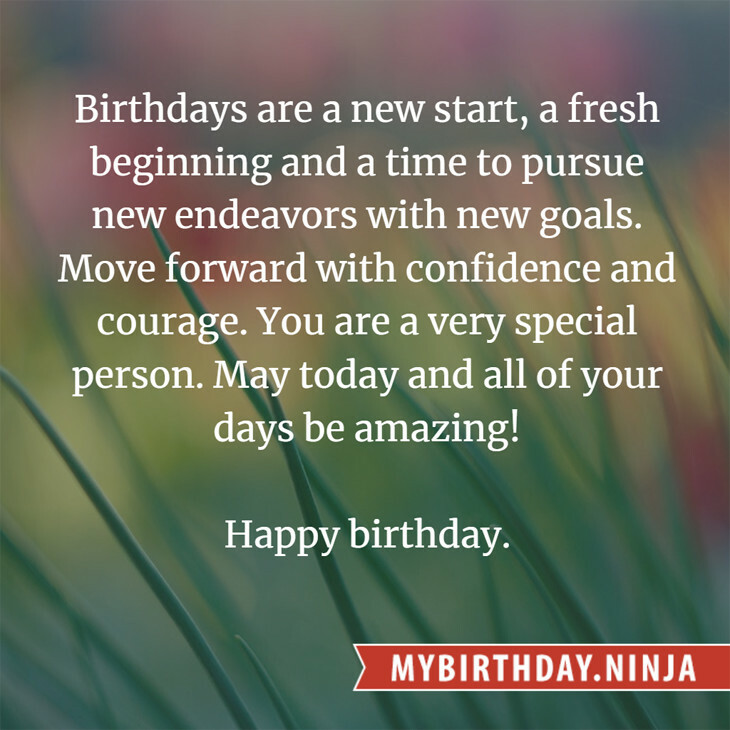 What happened on my birthday – Aug 17th? Hundred Years’ War: Battle of Verneuil: An English force under John, Duke of Bedford defeats a larger French army under Jean II, Duke of Alençon, John Stewart, and Earl Archibald of Douglas. A first group of colonists sent by Sir Walter Raleigh under the charge of Ralph Lane lands in the New World to create Roanoke Colony on Roanoke Island, off the coast of present-day North Carolina. Gaspar de Borja y Velasco is made a cardinal by Pope Paul V.
American Civil War: Battle of Gainesville: Confederate forces defeat Union troops near Gainesville, Florida. Pike Place Market, a popular tourist destination and registered historic district in Seattle, opened. World War I: Battle of Stallupönen: The German army of General Hermann von François defeats the Russian force commanded by Paul von Rennenkampf near modern-day Nesterov, Russia. World War II: U.S. Marines raid the Japanese-held Pacific island of Makin (Butaritari). The first forced evacuation of settlers, as part of Israel’s unilateral disengagement plan, starts. American swimmer Michael Phelps becomes the first person to win eight gold medals in one Olympic Games. View the complete list of August 17 historical events. Curious about this Lime Green Buttercream? This is a party item you can activate and send to your friends when you play the free game Jump Birthday Party. It’s a fun and easy-to-play mobile game for all ages. Get free 1,000 gold coins when you download today! What does my birthday August 17, 1958 mean? Your birthday numbers 8, 17, and 1958 reveal that your Life Path number is 3. It represents vision, imagination and joy of living. You possess a great talent for creativity and self expression. The following celebrities also have the same life path number: Robert Lindsay, Tommy Steele, Tommy Andersson, Michael Praed, William C. Woxlin, Jack Dunham, David Pack, Keith Carradine, Benedita Pereira, Diane Baker. 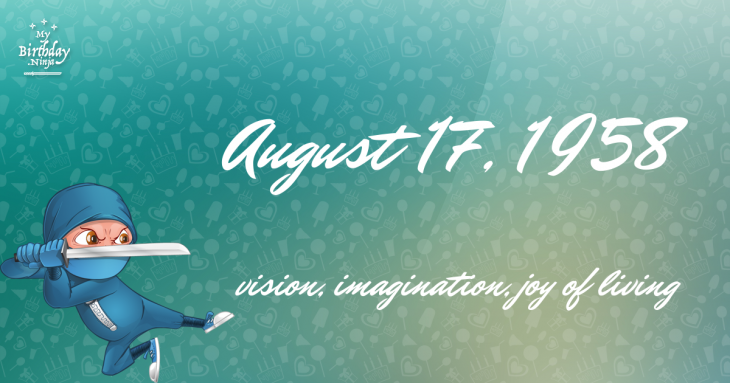 What is the birthday horoscope for Aug 17, 1958? The Western zodiac or sun sign of a person born on August 17 is Leo ♌ (The Lion) – a fixed sign with Fire as Western element. The ruling planet is Sun – the center of our universe. According to the ancient art of Chinese astrology (or Eastern zodiac), Dog is the mythical animal and Earth is the Eastern element of a person born on August 17, 1958. What is the birthstone for August 17? Fun fact: The birth flower for 17th August 1958 is Poppy for preparedness. What is the Love Match for Aug 17, 1958? When it comes to love and relationship, you are most compatible with a person born on June 22, 1984. You have a Love Match compatibility score of +133. Imagine being in love with your soul mate. On the negative side, you are most incompatible with a person born on January 22, 1966. Your incompatibility score is -141. You’ll be like a cat and a dog on a love-hate relationship. Arf-arf, I want to bite you. Meow-meow, stay away from me! What is a good birthday trivia for August 17? The number-one hit song in the U.S. at the day of your birth was Nel Blu Dipinto Di Blu (Volare) by Domenico Modugno as compiled by Billboard Hot 100 (August 18, 1958). Ask your parents if they know this popular song. I do not know how you feel about this, but you were a female ♀ in your last earthly incarnation. You were born somewhere around the territory of Southern Australia approximately on 1200. Your profession was trainer, holder of the fine animals, birds, insects. How many babies were born on August 17, 1958? Base on the data published by the United Nations Population Division, an estimated 103,731,629 babies were born throughout the world in the year 1958. The estimated number of babies born on 17th August 1958 is 284,196. That’s equivalent to 197 babies every minute. Try to imagine if all of them are crying at the same time. What is the popular baby name on 17 Aug 1958? What’s your bizarre Florida Man story? The #FloridaManChallenge is breaking the Internet and social media. Some crazy men, women, or creatures from the Sunshine State are making headlines every day of the year including your birthday. Try this fun exercise. Pick your search engine of choice and type in “florida man August 17” and see what kind of wild news headline you will get. This viral craze started in 2013 and gets resurrected now and then. The latest was from Tumblr and found its way to Twitter. As they say, the rest is history. Here’s a quick list of all the fun birthday facts about August 17, 1958. Celebrities, famous birthdays, historical events, and past life were excluded. Try another birth date of someone you know or try the birthday of these celebrities: July 31, 1998 – Rico Rodriguez, American actor; October 21, 1956 – Carrie Fisher, American actress and screenwriter; December 13, 1917 – John Hart, American actor and producer (d. 2009).